Kererū are the great gardeners of the New Zealand skies. Native to New Zealand, kererū (Hemiphaga novaeseelandiae) can be found on the North, South and Stewart islands and many forested offshore islands. 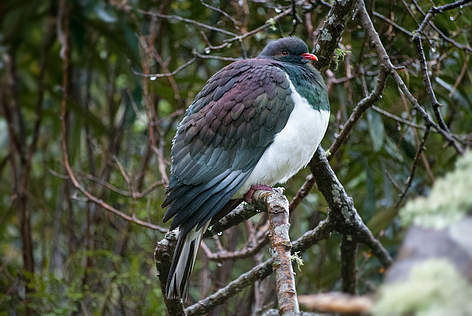 This species is also known as kereru, kukupa, kuku, wood pigeon, native pigeon, kokopa and New Zealand pigeon. There is no other species in New Zealand that looks similar to the kererū, apart from the Chatham Island pigeon (Hemiphaga chathamensis), which is confined to the Chatham Islands. Kererū eat the fruit, leaves, twigs, buds, and shoots of over a hundred native, and 50 exotic, shrubs and trees. Occasionally, they gorge so heavily on ripe fruit that they become very full (or “drunk”) and have been known to fall out of trees. Kererū recovery is critical to the survival of New Zealand's unique forests, because they are one of the only surviving mainland native species able to swallow the fruit of some of these forest trees. Some of these seeds need to pass through the gut of a bird to germinate, meaning the health of our forests is absolutely dependent on kererū. The 2017 Great Kererū Count will take place from Friday September 22nd to Sunday October 1st. For more details visit Kererū Discovery. To learn more about kererū, visit New Zealand Birds Online or Kererū Discovery. building up a picture of the key threats to kererū, enabling us to be more effective in managing these threats. Vision: to one day see large flocks of kererū in our skies again. The Kererū Discovery Project is a partnership of WWF-New Zealand and Wellington City Council, with support from Victoria University of Wellington, Forest & Bird, Te Papa Tongarewa Museum of New Zealand, Wellington Zoo, Zealandia (Karori Sanctuary Trust), Nelson City Council and the Department of Conservation.